A CAT Geometry question that appears in the Quantitative Aptitude section of the CAT Exam broadly tests an aspirant on the concepts - Triangles, Circles, Quadrliaterals, Polygons & mixture of the above mentioned concepts. In CAT Exam, one can generally expect to get 4~6 questions from CAT Geometry. CAT Geometry is an important topic with lots of weightage in the CAT Exam. Make use of 2IIMs Free CAT Questions, provided with detailed solutions and Video explanations to obtain a wonderful CAT score. If you would like to take these questions as a Quiz, head on here to take these questions in a test format, absolutely free. x, y, z are integer that are side of an obtuse-angled triangle. If xy = 4, find z. How many isosceles triangles with integer sides are possible such that sum of two of the side is 12? Sides of a triangle are 6, 10 and x for what value of x is the area of the △ the maximum? Perimeter of a △ with integer sides is equal to 15. How many such triangles are possible? △ABC has integer sides x, y, z such that xz = 12. How many such triangles are possible? 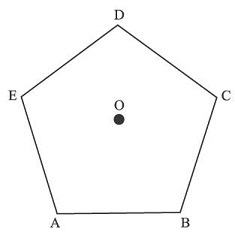 ABCDE is a regular pentagon. O is a point inside the pentagon such that AOB is an equilateral triangle. What is ∠OEA? Consider a right–angled triangle with inradius 2 cm and circumradius of 7 cm. What is the area of the triangle? What is the ratio of longest diagonal to the shortest diagonal in a regular octagon? Find the altitude to side AC of triangle with side AB = 20 cm, AC = 20 cm, BC = 30 cm. ABCDEF is a regular hexagon inscribed inside a circle. If the shortest diagonal of the hexagon is of length 3 units, what is the area of the shaded region. A circle of radius 5 cm has chord RS at a distance of 3 units from it. Chord PQ intersects with chord RS at T such that TS = 1/3 of RT. Find minimum value of PQ. Triangle has perimeter of 6 + 2√3 . One of the angles in the triangle is equal to the exterior angle of a regular hexagon another angle is equal to the exterior angle of a regular 12-sided polygon. Find area of the triangle. Rhombus has a perimeter of 12 and one angle = 120°. Find its area. Two mutually perpendicular chords AB and CD intersect at P. AP = 4, PB = 6, CP = 3. Find radius of the circle. Triangle ABC has angles A = 60° and B = 70°. The incenter of this triangle is at I. Find angle BIC. Rhombus of side 6 cm has an angle equal to the external angle of a regular octagon. Find the area of the rhombus. A circle inscribed in a square of side 2 has an equilateral triangle inscribed inside it. What is the ratio of areas of the equilateral triangle to that of the square? An acute-angled isosceles triangle has two of its sides equal to 10 and 16. Find the area of this triangle. Three equal circles are placed inside an equilateral triangle such that any circle is tangential to two sides of the equilateral triangle and to two other circles. 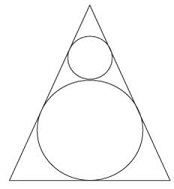 What is the ratio of the areas of one circle to that of the triangle? Consider Square S inscribed in circle C, what is the ratio of the areas of S and Q? And, Consider Circle C inscribed in Square S, what is the ratio of the areas of S and Q? Consider equilateral triangle T inscribed in circle C, what is ratio of the areas of T and C? Consider Circle C inscribed in equilateral triangle T, what is ratio of the areas of T and C? Consider Regular Hexagon H inscribed in circle C, what is ratio of the areas of H and C? Consider Circle C inscribed in Regular Hexagon H, what is ratio of the areas of H and C? What is the distance between the orthocentre and the circumcenter of a triangle who sides measure 24 cm, 26 cm and 10 cm? 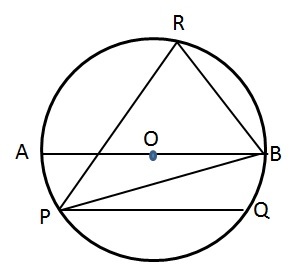 Two circles with centres O1 and O2 touch each other externally at a point R. AB is a tangent to both the circles passing through R. P’Q’ is another tangent to the circles touching them at P and Q respectively and also cutting AB at S. PQ measures 6 cm and the point S is at distance of 5 cms and 4 cms from the centres of the circles. What is the area of the triangle SO1O2? 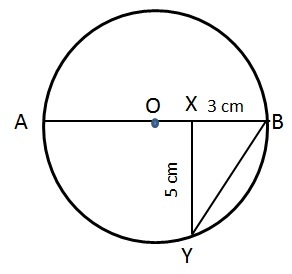 What is the circumference of the below circle given that AB is the diameter and XY is perpendicular to AB? The two sides of a triangle are 8 cm and 9 cm and one angle is 60∘. Which of the following can be the length of its third side? There is a set of parallel lines with x lines in it and another set of parallel lines with y lines in it. The lines intersect at 12 points. If x > y, find the maximum number of parallelograms that can be formed. There are 2 concentric circles, one big and one small. A square ABCD is inscribed inside the big circle while the same square circumscribes the small circle. The square touches the small circle at points P, Q, R and S. Determine the ratio of circumference of big circle to the polygon PQRS. Two circles of radius 5 cm have a direct tangent PQ and an indirect tangent RS. Find the length of PQ if RS = 24 cm. In the below figure which of the following holds good? M and N are two points on the side PQ and PR of a triangle PQR respectively such that MNQR is a trapezium and MN:QR = 2:5. Find the ratio of the area of triangle PMN : Trapezium MNQR. The Olympics committee came up with a new rule. The flag of the gold medal winning team would be hoisted to the right (AB) at 5m. The flag of silver medal winning team would be hoisted to the left (PQ) at a height of 3m. The flag (MN) of bronze medal winning team would be hoisted at the point of intersection of the line joining the top of each of AB and PQ to the foot of other, as shown in the figure below. A and P are 8m apart. In a wrestling event, India won the bronze medal. Find the height at which the Indian flag was hoisted. The number of sides in a regular polygon is ‘T’ times the number of diagonals in it. What is the interior angle of this polygon in terms of T?